In understanding how my alter states of being channel through me, I understand that Vennie, me the writer/artist, is the most prevalent existence. She presents on behalf of the sisters. So Vennie got the urge to paint tonight and in a couple of hours this painting emerged. I was recalled to the young girl in the Alaska tundra so many years ago and how much nature pulled her through despair. She loved to draw horses and felt a deep connection with them. She flew away and rode horses in the worst of times, long before she ever rode a real horse, save the brief “on the pony in a cowboy hat” photo taken when she was 2. She knew how to navigate her way through the terror somehow. What a skilled little girl she was. I feel Madge healing; really getting more and more integrated into Maude, and that feels rather calming. 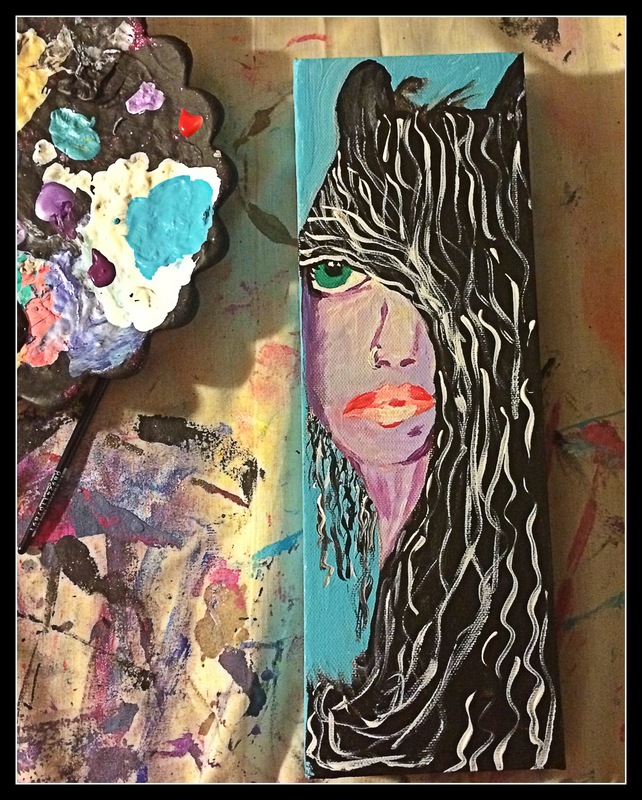 Here is her painting, “Feral Girl”. It feels like a self portrait, how Maude sees herself as Madge, as a teenager, as well as who she is in her dimension. A gothic, yet beautiful soul, trying to find her way back home. Posted on September 14, 2014 by Vennie Kocsis •	This entry was posted in States of Being and tagged acrylic, angels, arcturian, arcturus, art, artist, creativity, cult survivor, did, dissociative identity disorder, painting. alters, sam fife's move of god, vennie kocsis. Bookmark the permalink.